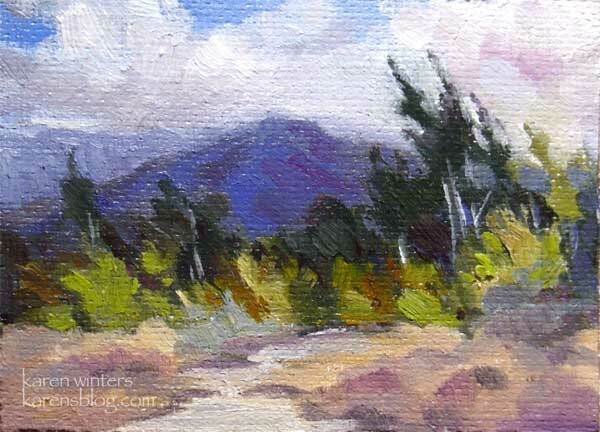 This quick impression of Hahmongna park captures the feeling of the San Gabriel mountains when summer thunderheads bring rain to the high desert. The weather has been hot and humid, and the thunderheads are the evidence. The heat is keeping people away from Descanso Gardens, much to our disappointment. But the weather is supposed to improve, and the weekend will be in the mid 80s … a big drop from the close to 100 degrees we’ve been experiencing. I love the spontaneity of this one! Nice, Karen. I especially like the painterly brush strokes in this one. You can see that it’s painting, yet it looks real too. That, certainly, is what we are after, isn’t it. Also, that dry brush in the foreground is lively with the subtle color in it. The blessing of maturity, born of a lot of work through the years, is to be able to paint like that at will!